As with January 19, I wonder whether the creators of today’s Meditation had already known about the bonfire of the vanities that took place on this day in 1497, had maybe always wanted to make a game about it perhaps, or whether the Meditations project led them to a search engine for notable events for February 7. In this Meditation, people dressed something like Atwood’s handmaids stand in two lines on either side of a bonfire. 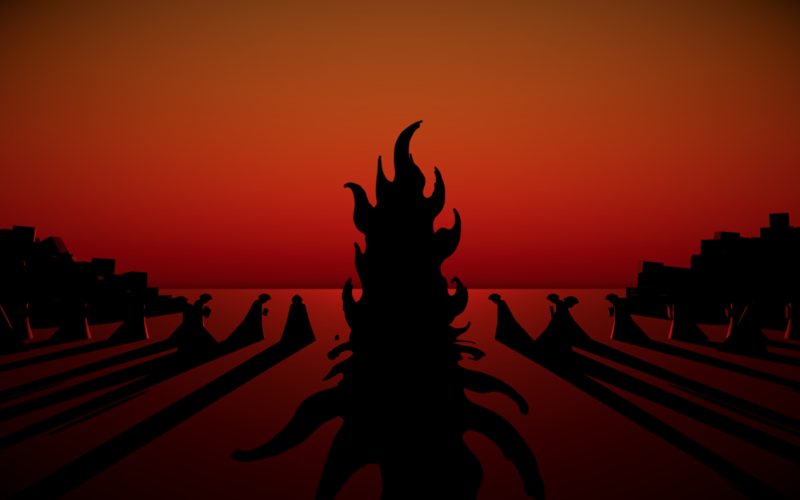 Click on either side, and the first person in that line will step forward and throw an item into the flames. When the fire grows to the top of the screen, the game ends. I have the same visceral discomfort that I’m sure many people do with the idea of burning things like books, manuscripts, and artworks. This game is too abstract to trigger that reaction, though certainly symbolic enough to provoke thought. But it makes me think of another game I’ve played recently: The Book Ritual, by Alistair Aitcheson, in which you feed real books to a real shredder. On his website, Alistair writes that the game is “about dealing with loss and accepting change.“ I know that it makes some people very uncomfortable. It makes me think about the role of art, and whether, if your goal is to make people think about this kind of destruction, it is more effective to have people physically – not just virtually – carry out that destruction for themselves.